Two San Diego librarians, Jenne and Miko, created fictitious dishes from the Harry Potter series to celebrate Harry Potter month, a fictitious holiday created by Scholastic. They share their recipes, photos, and whether you should bother to try them at home on their blog, 36 Eggs. They recreated a Hogwarts breakfast of porridge, plates of kippers, mountains of toast, and dishes of eggs and bacon. 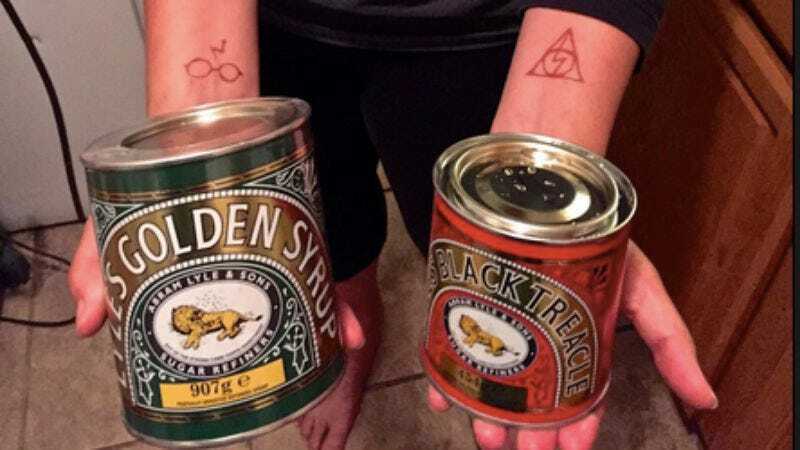 They made Mrs. Weasley’s Chicken And Ham Pie from Harry Potter And The Goblet Of Fire, and Hagrid’s treacle toffee that “cemented his jaws together” in Harry Potter And The Chamber Of Secrets. On July 31, they made Mrs. Weasley’s Golden Snitch Cake for J.K. Rowling’s birthday. And as if that wasn’t enough, they indexed every food and drink mentioned in the Harry Potter series. To be included, a food or drink needed to be physically present in the story and not just mentioned by a character; it must be mentioned in a separate meal, and it must be a specific dish or beverage. It turns out these two bibliochefs have created fictional dishes from other favorite books, including a traditional blancmange from Louisa May Alcott’s Little Women, which they admit didn’t taste too good, and Trisha’s Melt-in-Your-Mouth Muffins from Judy Bloom’s Summer Sisters. According to their blog, they plan to recreate flaming Christmas pudding around the holidays, for their Very Harry Christmas. But first, some desserts from The Boxcar Children, a series of 19 books by Gertrude Chandler Warner that still offer no clue as the whereabouts of the parents.